There’s nothing more that I love than infusing Disney magic into my time in the kitchen! I especially love preparing food and creating simple recipes that can double as an everyday meal or snack, as well as pretty enough to use as a party food! 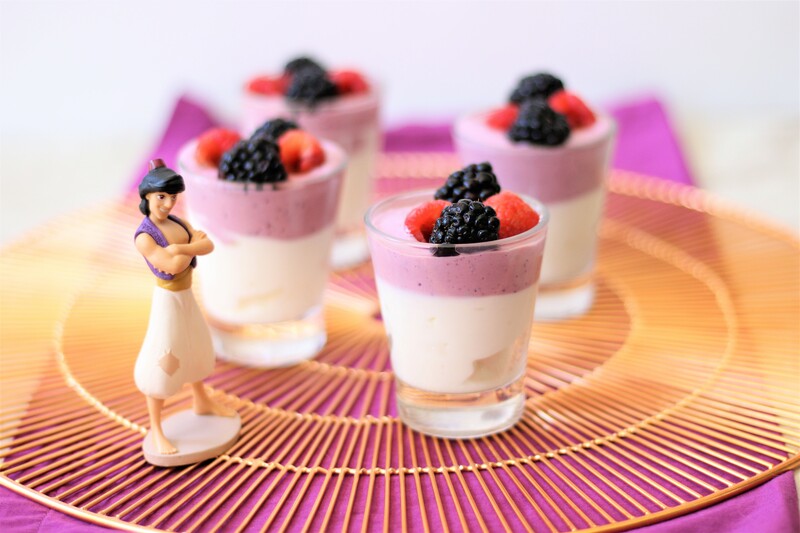 I created Aladdin inspired mini yogurt parfaits that can be used for just that! Whether you want to enjoy them for breakfast, snack, a food for an Aladdin party, or a lighter dessert, these min Aladdin yogurt parfaits are sure to hit the spot. An additional 1/2 cup of plain Greek yogurt or vanilla yogurt. Extra blackberries and fresh raspberries to top. Fill 4 espresso shot glasses or small parfait glasses 3/4 full with your plain Greek or vanilla yogurt. In a blender, blend together your additional 1/2 cup of yogurt with blackberries and maple syrup. Top the rest of your shot glasses with the blackberry yogurt you just made. Complete with raspberries and blackberries for topping. Super simple, clean, and healthy! And easy enough to make these parfaits with a junior chef in the kitchen helping you!